Home Mobile	Canadian Mobile Carriers: Who Owns Who? 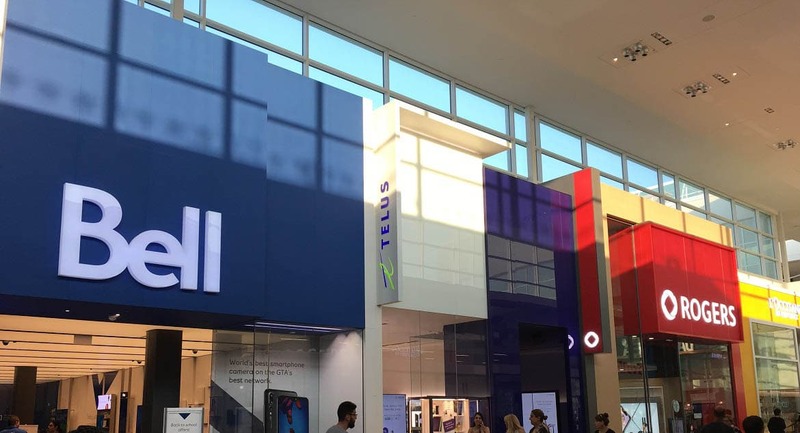 Image: Bell, Telus & Rogers stores side by side. The Canadian mobile carriers scene has always been somewhat of a mystery – new carriers popping up, old carriers getting bought out, gas stations offering mobile plans and prices changing province to province. With over 2 dozen brands across the nation, navigating through this maze can definitely be a challenge. While majority of wireless spectrum is owned by a few dominant carriers, why are there so many brands with all sorts of offerings and who are they? Who Owns Wireless Spectrum in Canada? First off, you might be wondering what ‘wireless spectrum’ means. Essentially, all of our wireless communications travel over what is called spectrum or radio frequency. These frequencies were initially owned and controlled by the government and sold to carriers. Carriers build out network towers to have the signal reach all corners of our nation. Owning wireless spectrum is therefore essentially like owning the pipes to connect cell phones to the the rest of the world. Let’s start with the major players, those that actually own the towers and send the waves across the nation to keep our devices running with strong signal and LTE data no matter where we go. While there has been a lot of controversy on the topic and the never ending conversation of Canada’s mobile carrier space being an oligopoly, the top 3 mobile carriers (including subsidiary brands) in Canada hold close to 90% market share. Yes, that’s A LOT of market share! The following table outlines key carriers. We would refer to these carriers as full-service. Bell Mobility Nationwide Canada’s second largest carrier BCE Inc.
Who owns all of these subsidiary brands? So you’re probably thinking great, all these large carriers are owned by even larger corporations with tons of resources at their disposal. But what about brands like Koodo, Public Mobile, Virgin, Fido, Chatr and Lucky Mobile – who owns them? What’s the need for them? These subsidiary brands all rely on the power of their parent company’s network and use it’s resources to deliver their services. Therefore, in some instances below, you can expect the same network strength and coverage as the parent company. What is a Mobile Virtual Network Operator? So hopefully the mobile carrier scene is starting to get a little clearer. But what about those random brands we see in the gas station and grocery store like Petro Canada Mobility, PC Mobile, 7-Eleven SpeakOut – who owns them if it’s not the big brands? This takes us to our next tier of mobile carriers known as Mobile Virtual Network Operators or in short, MVNOs. These carriers do not own any wireless spectrum; instead they usually enter into lease agreements with the large carriers to run their services on those networks. While these brands still require all of the business functions to run an independently branded carrier, they can either set up their own business and support infrastructure or use a company to come in and enable them, which we’ll discuss below. What about Mobile Virtual Network Enablers? As eluded to above, an MVNO can be as simple as a brand, with all network capabilities leased from those that own the spectrum. They can also bring in an MVNE such as Ztar Mobile to provide administrative functions, business support functions and operations support to complete the business model. While Mobilicity and Public Mobile had both acquired their own wireless spectrum through the government auction process as part of the government’s attempt to increase competition in the Canadian mobile carriers space, that didn’t last very long with both being sold to one of the larger carriers. While we haven’t covered every single mobile carrier that operates in Canada, we hope the above gives you a good general overview of the Canadian mobile carriers landscape and helps you understand who owns who! Keep in mind that you can transfer your number to any carrier, so if you decide to switch carriers, be sure to advise them early on in the process that you want to bring your old number with you. You will also need to make sure your phone is unlocked if you plan to use your current phone with the new carrier. For some further reading on how the Canadian Wireless Spectrum Auction works including license ownership and geographical coverage, there is a great, recent study on the CRTC website which you can find here. I don’t know about other mobile carriers but If you can’t afford to wait one hour plus to talk to a live agent , do not consider Koodo for your needs. Their customer service is one of the worst things I have gone through, just to cancel my account. Their services are also very expensive, morw than twice of what I am paying now for prepaid plan.